You had the best of intentions, you really did. And now your belly is full of food– and regret. “Will I ever be able to stick to my diet?” you sigh. After all, you know what to do. You’re smart and capable and a Child of God. You have the Holy Spirit living in you and yet you continue to “fail” time and time again. It’s a funny thing– knowing that you have everything you need to live a Godly life and yet feeling completely incapable of walking it out. Guilt and frustration build as shreds of shame surface, putting a wedge between you and God. My friend, through Jesus’ blood, it was never meant to be this way. Your freedom hinges on your confidence to approach God, your very present help in time of need. If the enemy has you bound in condemnation, you’ll stay stuck. It is time to take back the grace due to you so that you will be empowered to turn the other way. I remember sitting behind a Gold Ford Taurus wagon (remember those?) at a stop light, staring at those 9 words. A catchy phrase that held a lot of truth. I knew the Bible said that as a Child of God I am loved regardless of my performance. But, I just couldn’t wrap my head around the idea… It was no wonder I felt so unsettled. These 4 truths may not sink into your spirit right away and that’s ok. Freedom doesn’t hinge on you being 100% sure and completely free of unbelief. Rather, freedom comes when you act as if you believe. Are you ready to try on a new mindset for size? Let’s go! 1. Your failures don’t surprise God. The morning that you were so sure you’d stick to your food plan– God knew you’d have “messed up your diet” by 2 pm. He wasn’t surprised. While it is Biblical to repent (agree with God that this was not your best idea), there is no need to dwell on your misstep. Psalm 128:8 NLT The LORD keeps watch over you as you come and go, both now and forever. I do not imagine the Creator of the Universe, the One who holds every cell together, sitting in Heaven wringing His hands over your second (ok, third) serving of chocolate cake. Failures happen and, as you will see, our fellowship is His desired outcome. We’re flawed but He made us and HE knows we are dust (Psalm 103:14). 2. He sees you as He sees Jesus. Your Heavenly Father sees your struggles, but He does not judge them the same way you do! He doesn’t shame us and neither should you. If you have accepted Christ as your savior, your actions may reflect your sin-nature but not your new nature. When you were born again, your past, present, and future slips were washed away. If you allow your sin to bog you down, what energy will you have to keep moving forward? Rather than dwelling on your shortcomings, why not express gratitude that how much you eat cannot define you! 3. You’ll see your need for Him. My friend, we are going to “fail.” Probably more times than we can count on one hand. And, that is just today. Our knowledge of failure comes as a result of knowing right from wrong– we learn what is right through the instruction of the Lord, by His law. When we examine ourselves by the law, we see how truly inadequate we are to live the Holy life God has called us to. Without Him, we follow after earthly things, seeking only to please our flesh. This acknowledgment can cause us to hide or motivate us to seek shelter. The purpose of the law is to point us to our need for Christ (Romans 7:7-25). Wow, stop and think about this– the enemy wants your shortcomings to make you feel bad, to weaken your relationship with God and your witness. BUT GOD turns those ailments into assets when they point you to the Author and Perfecter of your faith, Jesus Christ (Hebrews 12:2). 4. You’ll grow closer to Him. Have you come through a difficult life circumstance closer than ever to those who stood by you? I sure have. About the time that our daughter turned 6 weeks old, I was sidelined with postpartum depression and anxiety. Every hour felt like a day; every day like an eternity. My family stood by my side and never let me go. I am forever filled with gratitude, trust, and admiration for my loved ones. Imagine how close you will grow to God when you fully invite Him into your eating. When He is the source of your strength and the motivation of your change, radical transformations happen. As you pray for help, seek His guidance, and look upward with a half-eaten cookie in your mouth, you’ll be strengthening that bond. You will grow in gratitude, trust, and admiration for the Lord. Eating is daily and God wants to be involved in our day-to-day life. When you invite Him in, He will be with you through the ups and downs. When your best intentions crumble like the cookie you forgot to remember not to eat, He will be there. 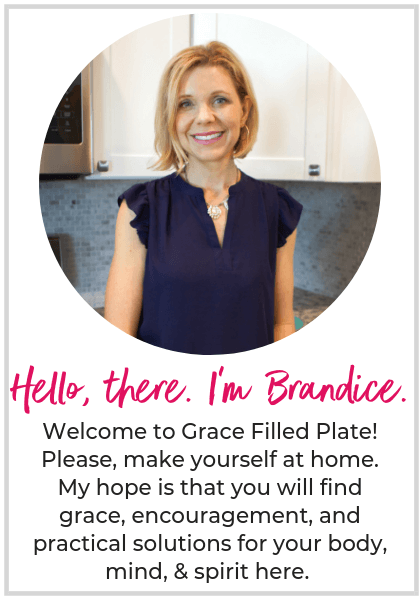 Rather than turning inward and staying steeped in that frustration that only leads to eating even more-– accept His help and choose a fresh start (even with a belly full!). Even when you have messed up your diet, you’re alright with Him! 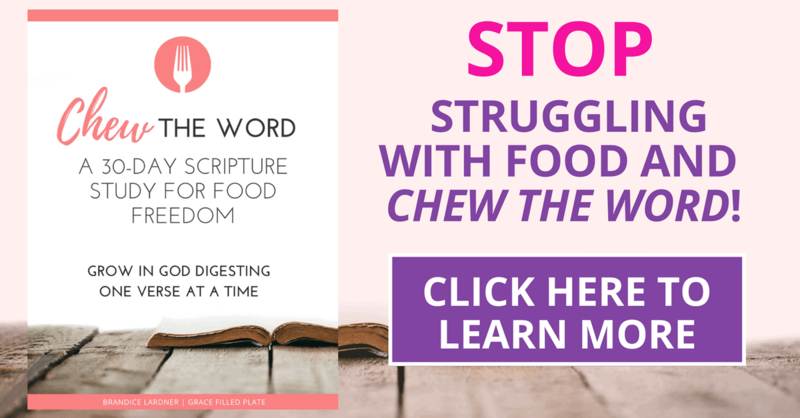 If you are looking to bring more of your faith into your food choices through the Word of God, I would like to introduce you to Chew the Word. Chew the Word is a 30-day study that guides you to scriptures that will change the way you look at your health for good. Then, there are specific questions that will help you pull out your personal application. Each week will wrap up with a review that will help you see the path of learning your Heavenly Father is taking you on. It’s a journey like no other. You don’t want to miss it.